The inevitable question when you announce that you are going to travel around the world: so where are you going? Even I was impatient to know the answer! – France (and perhaps a bit of side trips in neighboring countries) for 1.5 months. It’s the first stop (arrival Dec 18th) of our trip. This is a bit longer than our initial thoughts but it was due to a passport/visa issue that we have to stay put before we (I to be specific) can go any further. In any case, there is no lacking in things to do, places to go, and family/friends to catch up with in France. – South America for 3.5 months. It will include Argentina, Uruguay, Chile, and Peru for now, but we do have flexibility on how/where we want to go as long as we make our way from Buenos Aires (or bs. as. 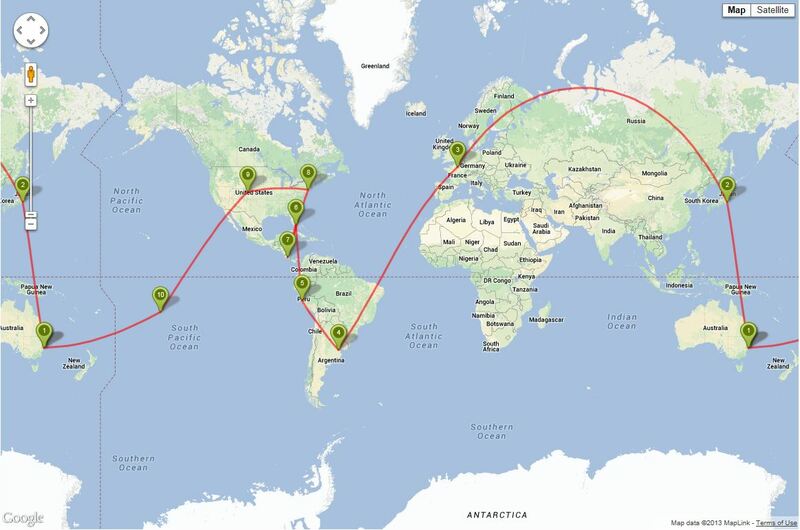 as the locals call it) to Lima/Peru in 3.5 mths time in mid May. It’s definitely shorter than I initially wanted, but then we have to give a bit of time away to France and Costa Rica. – Costa Rica for 1 month. Scuba diving is top on the list here. Anyone who has dived there is invited to leave comments here on where to go! – North America for almost 2 months. It includes NYC, Toronto, Quebec, Colorado etc. – Tahiti for 1 month: again, scuba diving! – then home, sweet home in Sydney. Now a bit of background information on why we chose to go where we are going. France is a given because we already planned many months ago to spend Christmas in France with Nicolas’ family. So in order not to further disappoint (and shock) the family than we already do, we bite our lips to stick to this plan even if it means some significant fare difference (we bought round-the-world tickets and got our original France return tickets refunded). So this is our first RTW stop (with a 5-hour layover in Tokyo – who can enlighten me what to do in the early morning of 7am in that airport with a toddler?). Latin America is a no brainer for me. I have always wanted to spend more time in Spanish-speaking countries. Ever since we went to Ecuador 9 years ago in 2004 I felt in love with this continent. We returned the following year to Cuba and Dominican Republic and once again my desire to be able to speak Spanish picked up more momentum. If you ask me, in my wildest dream I would love to live there for a few years. But for now, I can settle for travelling for a few months. Time to refresh my Spanish. Then why these specific four countries (Argentina, Uruguay, Chile, Peru)? Argentina is high on my list of Latin America. Do you have such places that you don’t know exactly why but you feel like you are meant to be? Well, Argentina is one of these places for me. Uruguay made its way into our itinerary because 2 friends highly recommended it, and also the short distance from Buenos Aires – a quick ferry ride indeed – makes it an easy choice to make. Chile is next door neighbor again and a logical sort of pathway if we travel northward (well, from Argentina it’s quite difficult to travel southward really without going to the Antarctic) to Peru. And don’t be shocked that I have absolutely no idea what to do/where to go in Chile apart from their wine, but that could be a nice start … We’ll figure it out I’m sure. Peru? Is Macchu Piccu a good enough reason in itself? And the rumor has it that the site might be closed down in a few years’ time due to the concern over the well-being of this magnificent wonder, so one just has to go while it lasts. Then Costa Rica. It’s a result of a 2-hour lunch with 2 friends. We were looking for somewhere warm in America to scuba dive but couldn’t decide where (had to let go of Galapagos unfortunately due to RTW flight constraints), then Costa Rica came into the picture, and sounds like a great choice. U.S. … now I have to confess that I never thought of travelling extensively in US, except the Big Apple! But one thing that made US very special for me is that we have lots of friends living there. But, damn, they all live far apart and US is damn big! So we had to choose, again. We settled on Colorado, besides NYC, where a dear friend lives (and would accommodate us, hooray, and finally I get to meet her son!) – the great outdoors there is a big draw card. I’m sure we’ll do a bit of side trips here and there between NY and Colorado. It might be the sort of country where we rent a car and do a bit of road trip … like what they do in the movies, maybe? Or I forgot Miami … well it’s not the typical type of place we would have gone, but do you know that if you fly from Peru to Miami (or anywhere in US for that matter) and stay there for over 6 days, and then you can enter Costa Rica without having to get a Yellow Fever vaccination? Welcome to the travel vaccine wonder land. Canada – Nicolas mentioned Quebec early on because, of course, they speak French there! But we put a question mark next to it on our initial planning map … well, we cannot go to all French-speaking places on the planet, right… ah, then timing sometimes means everything. Just as we were planning the trip, some friends (a lovely family we met through mothers’ group in Sydney) were planning to move back to Canada (to Toronto to be precise) and we got an open invite to their (future) place! The idea of meeting up someone from Sydney in Toronto in a year’s time sounds really quite appealing. So here we come, Canada (well, eastern Canada only perhaps). Tahiti is a long story … we tossed back and forth between Tahiti, Hawaii, Tokyo, Shanghai, and many combination in the between to make our last stop before coming back to Sydney. Finally we settled on Tahiti – scuba diving, again. And this is the type of place where you probably would go just once in a life time, and as it’s sitting beautifully on the way back from US to Sydney, we thought it’s perhaps worthwhile pay a little extra to get this ‘one-in-a-life-time’ destination off the list. Then other obvious questions would arise such as why not Africa (confidence issue I guess), why not Brazil (visa issue foremost, but also time issue. BUT never say never …), why not Europe (don’t want to be there in winter longer than necessary), why not Asia (well it’s ‘close’ to Australia and both of us have done quite a bit), etc etc. Let’s just say, 9 months is not as long as you thought. It’s a pity that my home country (China) didn’t end up being part of the itinerary, but we shall make it up post-RTW. Oh, let’s not forget New Zealand!! It deserves a special mention although it’s not marked on the map. It’s our pre-RTW warm-up trip, aka test trip. We are lucky to be able to spend 8 days at friends’ parents place (M, T, D, thank you!!) and we intend to simulate all that we are going to do for a RTW trip – we are bringing the exact luggage/gear with us, planning our days as if we already started the big wild trip, taking the public transportation to the airport, living like locals (we will most likely), spending day and night with Nina in a new environment. We shall see how this trip will turn out to be against our expectation. And perhaps then come back home to adjust some of our plans for the big trip. And of course, we do intend to enjoy New Zealand as well – finally! After 5 years in Sydney it’s almost a shame to say that it’s going to be my first trip there. It’s amazing how ‘simple’ our flight itinerary looks like on the map – just a few lines and that’s it. Maybe it’s because there is no detail to it yet. It’s like many things, once you see it from distance, everything looks much simpler. Even if I love the colors, texture, smell and the memories that go with all the details, sometimes it helps to make things look simpler. P.S: to follow our RTW experience: Trilingual Family blog, or Trilingual Family facebook group. Next Article: Where Is Nina? Maybe i can join in at Peru? let me check it how to get there from SH!